Dr. Robb enjoys the pursuit of knowledge, especially in fields outside of his domains of expertise. He is an expert in crop optimization for cut-flower production due to the culmination of many, many years of education, applied science research, and application. Having said that, one of the many fields Dr. Robb knows little about is fashion (despite his taking a Textiles and Clothing course as an undergrad). So, he was particularly pleased to learn something new, when he was researching his favorite type of T-Shirt: the baseball tee. 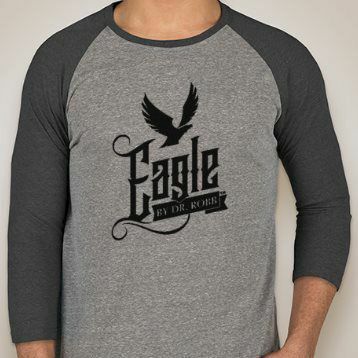 The “baseball tee” is actually called the Raglan shirt, and it is named after Lord Raglan, the 1st Baron Raglan. Word on the streets is Lord Raglan, aka Field Marshal FitzRoy James Henry Somerset, wore a coat with this style of sleeve after his right arm had to be amputated after fighting for the British Army in the Battle of Waterloo. Apparently, he demanded his arm back to retrieve a ring that his wife gave him. This guy was tough as nails! In honor of Field Marshal FitzRoy James Henry Somerset, 1st Baron Raglan, Knight Grand Cross of the Order of the Bath, Privy Council of the United Kingdom, Master-General of the Ordnance, Dr. Robb presents his Eagle by Dr. Robb Raglan T-Shirt for all to enjoy. Wear with pride!